Note: This was originally posted on my Patheos blog in 2015; Patheos still has not taken down my content even though I have made formal requests for them to do so. So I am copying over some of my posts to my personal blog here, so that I and others can link to them without giving Patheos advertising revenue. My apologies for the light posting as of late; summer is festival season, which means I’m busy with vending and other activities, and it’s tough to find time and energy to write. However, this particular topic has been rolling around in my head, and I finally found the right words for it. It all started a few weeks ago when birds–particularly crows–started fledging here in Portland. I began getting questions from people about scrawny, sick-looking birds that had others “dive-bombing” them as they sat on the ground. After seeing a few photos, it was pretty clear that people were seeing fledgling crows which, while ungainly-looking and still unsure of that “flying” thing, were in generally good health. The “dive-bombing” was parent crows feeding them, encouraging them, and otherwise staying close by in case danger threatened. Crows, after all, are highly intelligent and social; they understand what’s at stake during this vulnerable part of a young bird’s life. –Every spring and summer there’s a cavalcade of people who find baby birds on the ground or baby rabbits huddled in the grass. Baby birds do fall out of nests before they’re ready to fledge, and mother rabbits often leave their babies hidden (with varying degrees of success) for hours at a time. What people should be doing is putting the birds back in the nest if they can, or making a new nest by nailing an empty plastic tupper to a tree and putting grass and the bird in it (parent birds will often feed their young even in these unorthodox holdings.) 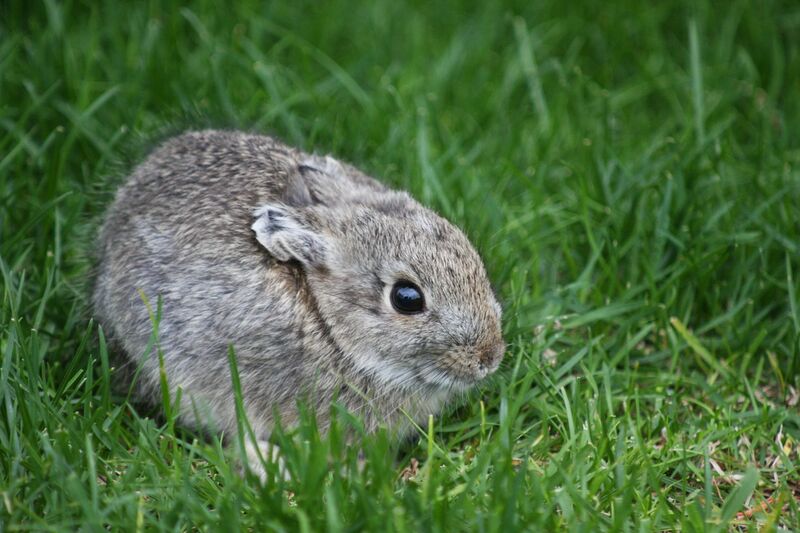 For bunnies, they should leave well enough alone, unless they look obviously ill, injured or otherwise distressed. Putting a circle of flour around them shows whether the mother has come back to check on them (thereby disturbing the flour) or not. Instead, they take possession of these little critters and either try to raise them themselves, or take them to a veterinarian or rescue facility. Even with the best of care, the mortality rate for birds and rabbits is significant, and quite often well-meaning humans sentence these animals to death by not leaving them in the wild. Here’s a good resource on what actually to do when you find baby animals unattended by their parents. –While we’re on the subject of rabbits, there are enough domestic rabbit owners who don’t understand rabbit behavior and health that someone had to write an article on why rabbit bath videos aren’t actually cute. If you don’t understand how to properly care for an animal, maybe you shouldn’t own one–or should at least do a lot more research on that species’ behavior and unique needs. —This video of someone feeding wild deer potato chips. Besides the fact that chips aren’t especially good food for anyone, least of all deer, these people are just encouraging the deer to lose their fear of humans. Why is this bad? Let me count the ways! Deer that aren’t afraid of humans are more likely to go wandering into people’s gardens and munch on the vegetables and flowers. 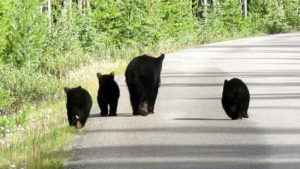 They’re also at greater risk of getting hit by cars (bad for everyone involved) and they’re easier targets for hunters (the easier population control doesn’t justify the means.) The more you feed deer, the more the deer are able to reproduce and survive through hard winters that would normally thin their numbers. That means overpopulation leading to greater rates of starvation, disease and other unpleasantries. —People laughing at this black bear that drank three dozen beers. Never mind that, again, beer isn’t good for a wild animal’s system. Like deer, bears are increasingly encouraged to see humans as a source of food. It’s not just a matter of campers not knowing how to bear-proof their food and drink, either. Many people deliberately feed bears and other wildlife, to include in mighty Yellowstone, because they want the animals to entertain them. They’re not content simply letting them be themselves. Eventually you end up with bears attacking people to get to their food, which all too often ends up with the bear being euthanized. —Apparently animal rights activists still think it’s a good idea to release farmed mink into the wild. What they think they’re doing is saving the mink from being skinned alive. (No, skinning animals alive is not a standard accepted practice in the fur industry.) Instead, they’re dooming most of those mink to slow, painful, cruel deaths by starvation or exposure because they come from generations of captive-bred animals. The ones that survive compete with native wildlife and cause many other animals to have slow, painful, cruel deaths by starvation because there’s not enough food to go around. Those mink can screw up ecosystems for decades as invasive species. So much for kindness to animals. I could go on and on about our inability to treat other animals the way they need to be treated, and our own lack of skills for when we’re outside of a comfortably civilized setting. We learn in school how to determine the hypotenuse of a triangle, go over the Revolutionary War in excruciating detail every year in history class from fourth through twelfth grade, and our biology textbooks are distressingly generalized and sterile. With few exceptions, kids are kept corralled indoors except for recesses on blacktop playgrounds. We learn how to be good little worker ants in an industrial model, but we learn early how to ignore anything that isn’t human-centered. And we spend more time indoors than ever. We’re conditioned to see the outdoors largely as the place we have to traverse in order to get to the next indoor spot. These people who ask about fledgling crows–if they spent a year studying their local wildlife in detail, watching from a window every day, do you suppose they’d get some sense of the rhythm of non-human nature? 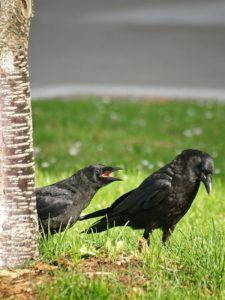 Maybe they’d get to watch a mated pair of crows build a nest, raise and feed their young, and then integrate those young into the greater corvid community. Perhaps they’d see a mother rabbit leave and return to her young in their hiding place, or watch deer grow up, lose their spots, and start their own lives well before November. Our utter lack of nature literacy and our disgraceful self-centeredness is leading us to destroy the entire planet, ourselves included. We need to know these things–we knew them once, but as we stopped living close to the land, we forgot them, ignored them entirely. We need to understand how delicately balanced an ecosystem is, the webs of relationships and balances that formed over thousands of years of fine-tuning and evolution. We need to know how much our actions can screw the entire system up, whether through introducing an invasive species or destroying habitat for one more golf course. We need to have our hands in the soil, watching the creek for the flash of a salamander’s belly, our eyes to the trees for the first sign of autumn’s flush of color. We need a personal relationship with non-human nature that doesn’t end with a perfectly manicured, chemical-treated lawn. But we don’t all have to know the particulars of climate science or marine biology or organic agriculture to be attuned to our local environment. It all starts with the little things, the individual animals, plants and fungi. What if the proper response to finding baby bunnies was as well-known as when the new season of Orange is the New Black starts? What if we looked forward to the fledging of baby birds as much as the arrival of Memorial Day? What if we knew how to watch the clouds, and were able to predict how long before rain showed up, so we could decide whether or not to water the garden? We need to return to an ancestral way in which nature is not an Other, but an Us. If we truly love nature, if we consider ourselves friends to the animals, then we need to know nature itself, through books and observations, through science and questioning. We need to know the rest of nature as well as we know ourselves. We can no longer afford nature ignorance; it is time to embrace nature literacy. Did you enjoy this post? Please consider picking up a copy of my book Nature Spirituality From the Ground Up, which weaves together natural history and pagan spirituality. While searching why it’s good or bad to hunt. What do you think? I think I don’t trust someone who’s never been hunting and actively works against anything other than a vegan lifestyle to be able to give a fair and balanced assessment of the pros and cons of hunting. Hi! What do you think of the Animal Rights arguments about how hunting cause “grieving animal families”? I mean, I know that hunting season starts when the babies are already on their own, atleast in USA, but I still want your opinion on whether the surviving herd members feel any long-lasting grief. 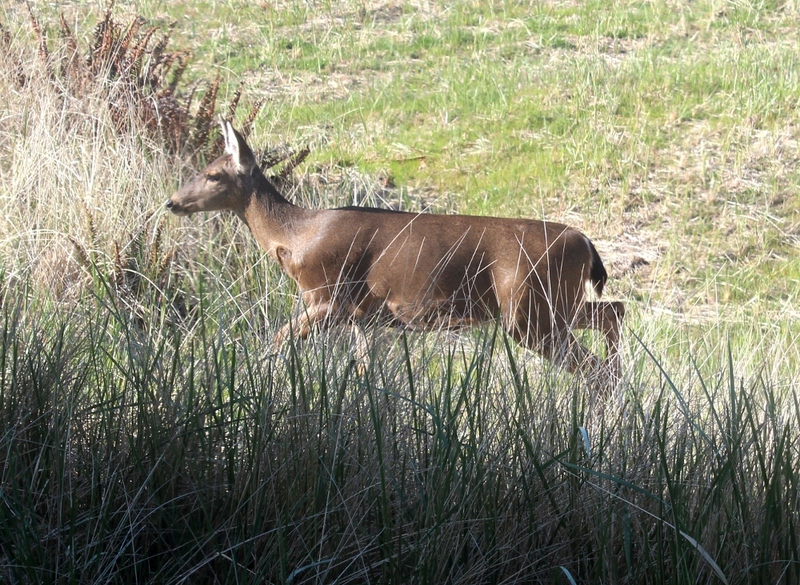 Personally, I think that since deer are prey animals they are used to losing herd members all the time. On the one hand, I am not entirely unconvinced that animals don’t grieve, particularly those with more advanced cognitive capabilities like elephants and dolphins. On the other, it’s really important to not anthropomorphize animals or otherwise project our biases onto them. Death IS a part of nature, but we are uniquely aware of it, both before, during, and after it is happening to another being. We are also aware of our own mortality. So whether we choose to be omnivores or not, I think it’s important to have reverence for death and the fact that in killing we are removing another being’s ability to be in this world, permanently.